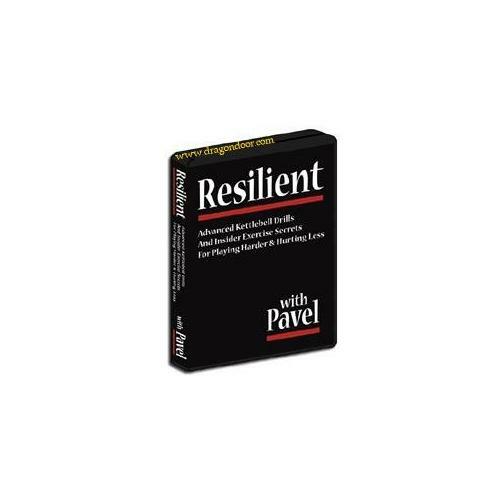 Pavel knows what it takes—personally and professionally—to remove crucial flaws and weaknesses from your body armor—so you can bounce back, time and time again, from the toughest challenge life throws at you. A winner isn't someone who never falls down, never gets knocked down…a winner is the man who keeps getting up, keeps coming back, no matter what you fling at them. It's the winner's edge. It's called RESILIENCE. It's called "don't know how to spell quit." So, in this specialized program, Pavel's put together 19 of his favorite drills for restoring and reinforcing your body's "rebound strength." Pavel's concentrated on the weak links—the knees, the elbows, the shoulders, the spine, the neck—and shows you how to change a liability-waiting-to-happen into a strength. Discover what it really means to be RESILIENT. Add years of wiry, tensile, pliant strength back into your life—and hurt a whole lot less while you're doing it. 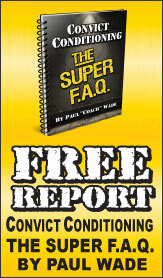 How sure are we that Resilient (DVD) will work for you? Simply fill out the form below and put Resilient (DVD) to work for you right now. Obviously, we would go out of business if Resilient (DVD) didn't work, the way we said, right? With the promise of a full refund if you're unsatisfied, you have nothing to lose by trying Resilient (DVD). Go ahead and try it today. Life has a habit of body-slamming us when we least expect it. And the more active we are, the more likely we're gonna be wrenched, tossed, torn, torqued, twisted, scrunched, hammered and generally whacked around. Hit your forties—let alone fifties—and you can be reduced to a tangled mess of injuries and performance-crimping tensions. You can't do what you want to do anymore. People don't want you on their team anymore. You can't compete anymore. You're...let's face it…washed up, as a card-carrying member of the active elite. A winner isn't someone who never falls down, never gets knocked down…a winner is that nightmare creature who keeps getting up and getting up, keeps coming back, no matter what you fling at them. Pavel's concentrated on the weak links—the knees, the elbows, the shoulders, the spine, the neck—and shows you how to change a liability-waiting-to-happen into a strength—weapon-of-choice. Discover what it really means to be RESILIENT. Add years of wiry, tensile, pliant strength back into your life—and hurt a whole lot less while you're doing it. Have fun—and watch your back go from whiner to smiler. Stretches your spine—for extra "activity-mileage"
Rated 10/10 Worth every penny! This dvd is probably the best I have ever viewed. The moves for the shoulders are excellent, the RKC arm bar, the tricep extension, and the one that really surprised me the most was the hack shoulder stretch ( I don't remember the actual name) was the best and made an immediate impact on my shoulders. Keep up the good work. Follow these tips and techniques and you will loosen your entire body...you will also strengthen your joints to prevent further injury or to recover quickly from working out or from activities in your daily life. Well worth the investment, especially when you begin to notice have started slowing down some...and you are not quite as limber as you once were in you youthful days. My copy of Resilient arrived earlier this week. I watched it that night, and did the parts I could remember the next two mornings. It struck me several times through the day how good I felt. Same feeling as when I first tried Relax into Stretch and the first time with Superjoints. Because I keep getting the improvement from each new product, I conclude that they complement each other, each one giving me something the others don't quite cover. Biggest revelation from the DVD was realizing how tight my shoulders are. Though I'm not a great flexibility guy, I thought I was doing pretty well. Ha. Guess I'll be getting the work I need there. Pain is good, as Pavel says. Relax into Stretch is about a safer and saner approach to the stretching work that is common in high school sports and martial arts. It teaches the body to go farther than it thought it could by learning that the muscles aren't really going to tear as you stretch out. Superjoints is about moving the joints through full range of motion. From my own experience and watching friends and relatives, range of motion is one of those use it or lose it things. I'm using it. Resilient is about recovering from and preventing injury by strengthening the supporting and stabilizing muscles around joints that commonly get abused. First, ankle work, because that's currently a nagging problem for me and I'd like to have seen Pavel's take on it. Pavel breaks these drills down wonderfully: first demonstrating, then focusing on finer points and offering visualizations for safety, power, and keeping form. As a member of a special reaction team, our training requires performance in any condition. Pavel's products and drills like these help keep me mobile and ready. 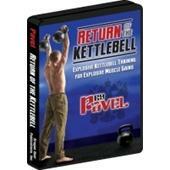 This DVD could be stand alone, but a knowledge of general and advanced RKC exercises is extremely helpful. Rated 10/10 Ever get beat up? I had one of those months. Between wrestling, brazilian jiu-jitsu, training for the Washington State Kettlebell Championships and the June 2004 RKC, I was run down and hurting. Just lots of hard training, plus getting bounced off the mat 100 times a day in my takedown class I felt like everything hurt. So I took a month, and all I did was Resilient exercises with my 26 lb kettlebell, Super Joints, and a little juggling with my 26 lb kettlebell. All my joints feel SOOOOO GOOD. Coming back I feel stronger and more solid everywhere. Now I'm still doing the Resilient exercies as preventetive medicine. The neck stuff is REALLY good for my brazilian jiu jitsu, plus how many times did I used to get shoulder and elbow tweaks? It just makes sense to keep it all strong and resilient. Pavel, I'm an old Infantry Marine. I've had back surgery, and more aches and pains than you could imagine. I got Resilient and started seeing results immediately. With out the Kettlebell I can hardly walk. When I practice on a regular basis, I feel like I'm in my twenties again. I own several of your products and I have never been disappointed. I will continue to come to you for my fitness and flexibility needs. After more than 15 years of powerlifting and going on 2 years of Kettlebells, I have had my share of aches and pains. Pinched shoulders, tight hips, knotted up back, aching elbows, sore...I doubt there wasn't a joint on my body not crying for relief. Fortunately deliverance came in the form of both Resilient and Super Joints dvds. After the first viewing and trying just a few of the exercises recommended in Resilient i began to experience immediate relief! I have since combined exercises from both dvds and have improved both range of motion and a total cessation of pain in certain joints. I am always skeptical to claims of "pain ending" solutions and supplements but I can't say enough about Pavel's knowledge and expertise when it comes to subjects such as strength and recovery programs! I don't know how Pavel does it, but with every new book or dvd he comes out with, it is filled with new and useful information all strength athletes(or any one for that matter) can use and benefit from. Rated 10/10 SWAT OFFICERS NEED TO WATCH "RESILIENT"
Hours upon hours wearing a full kit- vest with steel plates, commo gear, weapons, etc- leads to sore shoulders, lower backs and knees. Add running CQB or tackling other tasks and the Ibuprofen can vanish like M&Ms. "Resilient" provides simple, effective methods you can perform nearly anywhere to help restore range of motion and reduce discomfort. My knees and shoulders were improved after the first viewing. Resilient is yet another no-nonsense presentation from Pavel of things I've never heard of before that work for me like nothing else. The Wall Walk, which is now my replacement for the McKenzie exercise I used to do every day for my bad back, makes this DVD worth the price all by itself. I could never perform a back bridge without jamming my spine - I now Wall Walk my way into a bridge almost every day. The shoulder opening exercise fixed, in a few seconds, things that have been tight for years. And the list goes on and on - my neck has never felt better. 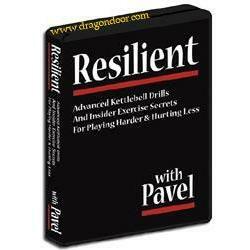 Pavel is a master teacher and watching Resilient is like having him in your living room, teaching you all that you need to know and nothing that you don't. I train harder, with fewer aches and pains, since I started practicing the drills on Resilient - what more could anyone ask for?